Are your runny nose and sneezing symptoms due to a cold or to seasonal allergies? It’s not always easy to tell, since they typically share the same essential symptoms. But there are a few symptoms that are unique to each, and these will help you to determine which ailment you have and then how to treat it appropriately. Colds are caused by a virus in the nasal cells. There are more than 200 types of viruses that cause colds, and each one causes inflammation that dilates blood vessels and mucus glands in the nasal passages, making it hard to breath and causing a leaky, runny nose. The inflammation also activates the sneeze and cough reflex in an effort to protect the body from the infection and causes the aches and pains sometimes associated more with colds than allergies. 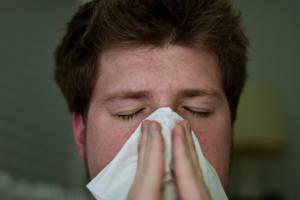 A runny nose and sneezing may also be caused by allergens. Allergens are tiny particles that stimulate cells in the lining of the nose and passageways in the lungs to release histamine and other chemicals. The presence of itchy eyes may be the the best indicator that your runny nose and sneezing are due to allergies and not a cold, since the cold virus rarely causes itchy eyes. Seasonal and environmental allergies will last as long as you are exposed to the allergen. Colds last from about three days to a week, although some people have symptoms for up to two weeks. When you or your child has a runny nose and is bothered by continual sneezing, you want fast relief! 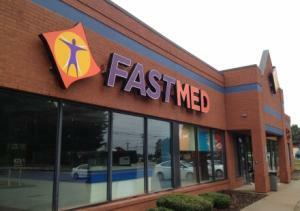 At FastMed Urgent Care, we understand your need for quick relief. That’s why we are open into the evening on weekdays and welcome patients on weekends, all without an appointment. Simply walk in at one of our state-of-the-art facilities, and you will receive top notch care, usually in under an hour. “Being sick stinks, but my experience at the urgent care clinic was top notch. ALL of the staff were kind, helpful, and good listeners. The medical center was much more attractive than the typical walk-in clinic and the service was amazing. If I had to feel bad enough to see a family doctor, at least I was fortunate to have a clinic like this one nearby. Thank you!! !” – Kim R.